multiple:Is used to allow the user to select more than one value from the drop-down list by using the Ctrl key. name:Is used to specify a name of the selection list that will be used at a time of submitting the form. size:Is used to specify the number of visible items in the selection or drop-down list.The default value is 1.If the value of the attribute is greater than 1, then a form field will be a list. autofocus: Is used to ensure that the focus is on the drop-down list when the page loads. 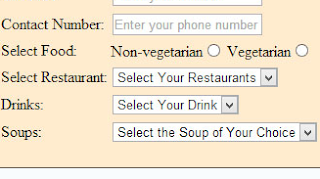 form:Is used to specify the name of one or more forms to which the <SELECT> tag belongs..
selected:Is used to indicate that particular option comes pre-selected when the page loads in the browser. 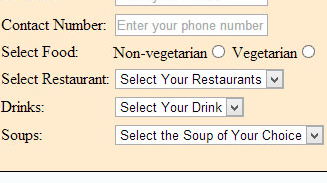 value:Is used to indicate the value of option to be sent on the form submission when that option is selected by the user. disabled:Is used to indicate that option should be be disabled when the page loads.